It's interesting how some K-series models are fairly ubiquitous and other, very similar, models are seen infrequently. It makes you wonder if shoppers of the time were drawn more to one style than to another or if it was purely a matter of supply. 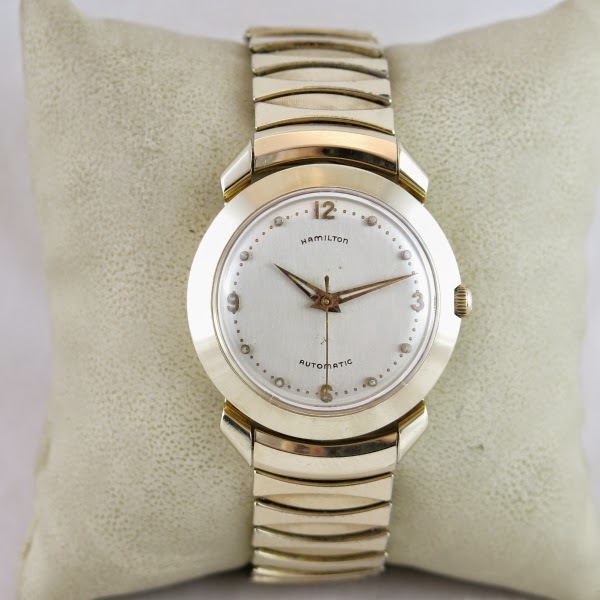 For example, you can't swing a dead cat without knocking a 1956 Automatic K-455 off the wrist of a Hamilton collector. You can find a K455 for sale all the time. It's a nice model, comes with two dial options and has a classic 1950's "flying saucer" vibe to it. 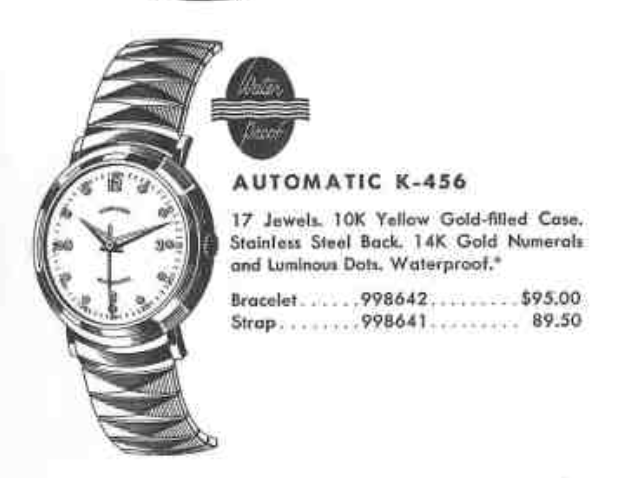 On the other hand, when is the last time you saw a 1956 Automatic K-456? It was made for the same duration as the K455... through 1958. However, you rarely see a K-456 in the wild. The Automatic K-456 looks very familiar. It looks like a cross between a K-455 and a 1957 Rotomatic I. It came in a 10K gold filled case with a stainless steel back. The dial features luminous dot hour markers with matching dauphine hands. Like pretty much all of the K-series models from the 1950's, you will find the 17 jewel 661 automatic movement inside. My K-456 project watch arrived in very good shape - a perfect project watch because it shows very little wear but doesn't look new either. The crystal has a few rub marks and the crown doesn't fit quite right but those are both easy fixes. This is my favorite style of screw-on back. Stainless steel is tough and the openings are strong enough for my case wrench to get a solid grip. The movement looks to be in great shape with no obvious corrosion anywhere. Based on the spartan case back, there are no signs whatsoever of anyone every servicing this watch in the past. I might be the first person disassemble this watch since it left Lancaster, PA in 1956. Everything is ready to be reassembled. There are a lot of parts in a 661 when you take it completely apart. The basic powertrain has been reassembled and the movement is now ticking away. It's off to the timer to listen to the ticking. I wish every watch I reassembled looked like this right out of the gate. Not much to complain about here... everything looks great. A new 28.1mm diameter high dome crystal will go a long way toward improving the look of this K-456. The other crystal was obviously old and it had turned a dull yellow. You can see what a difference a trip to the spa can make on even a relatively good looking movement. Notice how bright and shiny everything is now. I still need to shorten the stem a little so the crown will seat better. I decided to replace the crown with a better looking example, as the rest of this watch looks almost new. This K-456 has not seen a lot of wrist time over the last 60 years. I bet it will now, though. Hey Dan, I was wondering if you'd ever heard of a Norfolk model with a solid black dial and gold hour markers? I can't find the exact model of it, but it's the same case and movement as a Norfolk. I'd wager that the dial has been custom refinished to be black and is not original.